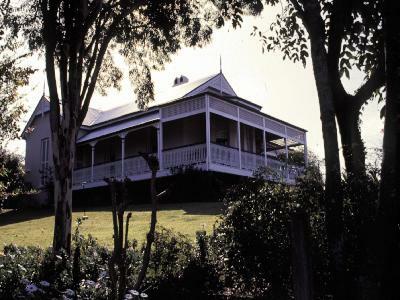 William Draper Box was a member of Queensland's now defunct upper house of parliament from 1874 to 1904. When he wasn't a parliamentarian he was described simply as "gentleman", although he was involved in the family mercantile business. He bought land at Milton from architect Benjamin Backhouse in 1865, and engaged Backhouse to design a house for the property. 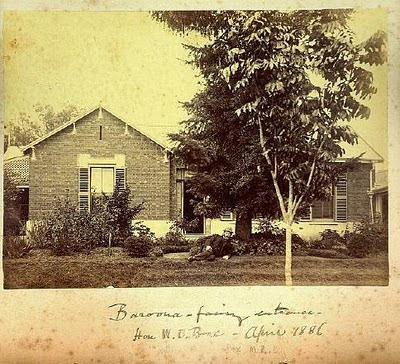 Box lived in the house, Baroona, until 1885 when he moved to Hamilton, renting Baroona to another politician, John Donaldson. The house that Backhouse designed was a single-storey masonry residence with a corrugated iron gabled roof. The photos above are annotated that they were taken in 1866, and seem to indicate that the man in the images is William Box. Brisbane is quite a hilly city, and in its early days, the wealthy chose to build on hilltops in various locations. 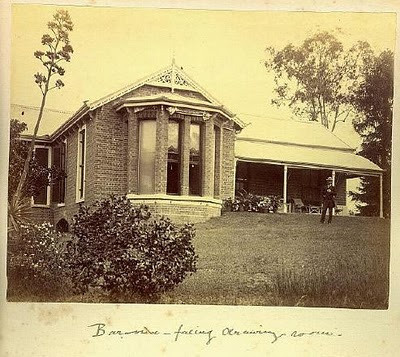 Baroona is perched on a ridge in what used to be known as Rosalie, now called Paddington. It is situated on a large section of land which also holds a lawn tennis court. If Brisbane's western tunnel proceeds, it will pass directly underneath this house. That will no doubt be causing the present owners some degree of concern. Thank you for showing us "our Brisbane". Compared ro other Australian cities, I feel we have such little architectural history left. We still need to be vigilant about our heritage, don't we? I recently saw Baroona in a book of historic Brisbane houses (1987). It mentions the gate entrance still surviving yet no longer associated with the house. Is this still the case or has it been demolished? There also also mention of a 'strange classic structure' of unknown history that is believed to be associated with the house. What is it? Does it still exist?